Harrisburg, PA - The Pennsylvania Department of Agriculture today announced that a deer harvested from a Wisconsin hunting preserve subsequently tested positive for Chronic Wasting Disease (CWD). The deer originated from a Lancaster County farm that is now under quarantine. DNA testing confirmed on February 13, 2018, that the deer was born and raised on the West Cocalico Township, Lancaster County, breeding farm. A two-and-a-half-year-old buck from the same farm tested positive for CWD earlier this month. Neither deer showed signs of the disease prior to its death. The farm has been quarantined since December 15, 2017, when Wisconsin’s state veterinarian notified the department of the potential traceback. DNA testing was run to confirm the deer’s identity in the absence of official identification tags for the deer. The department, along with the United States Department of Agriculture, is currently evaluating the farm in cooperation with the herd owner to establish a Herd Management Plan to mitigate the threat of this disease spreading. The plan, which all three parties sign, may include indemnification of the herd by the USDA or a continuous quarantine with mandatory testing. A quarantine would be extended five years every time a positive is detected. The infectious agent, known as a prion, tends to concentrate in the brain, spinal column, eyes, spleen, and lymph nodes. These high-risk parts must be properly handled and disposed of at the harvest location to prevent disease spread. Low-risk parts such as deboned meat, clean skull caps and capes present little risk and may be taken home. Find more information about Pennsylvania’s captive deer CWD programs and the department’s broader efforts to safeguard animal health at agriculture.pa.gov. Now DATCP records covering the past five years showed Hunt’s End acquired 31 deer from Windy Ridge, which also sent a combined 67 whitetails to nine other Wisconsin deer farms during that period. captive deer farmers breeders entitlement program, i.e. indemnity program, why? how many states have $465,000., and can quarantine and purchase there from, each cwd said infected farm, but how many states can afford this for all the cwd infected cervid game ranch type farms, and why do tax payers have to pay for it ??? CWD is a progressive, fatal, degenerative neurological disease of farmed and free-ranging deer, elk, and moose. There is no known treatment or vaccine for CWD. CWD is not a disease that affects humans. On July 18, 2012, USDA Animal and Plant Health Inspection Service’s (APHIS) National Veterinary Services Lab in Ames, IA confirmed that a male white tail deer harvested from a hunting preserve in southeast IA was positive for CWD. An investigation revealed that this animal had just been introduced into the hunting preserve from the above-referenced captive deer herd in north-central Iowa. The captive deer herd was immediately quarantined to prevent the spread of CWD. The herd has remained in quarantine until its depopulation on August 25 to 27, 2014. The Iowa Department of Agriculture and Land Stewardship participated in a joint operation to depopulate the infected herd with USDA Veterinary Services, which was the lead agency, and USDA Wildlife Services. Federal indemnity funding became available in 2014. USDA APHIS appraised the captive deer herd of 376 animals at that time, which was before depopulation and testing, at $1,354,250. At that time a herd plan was developed with the owners and officials from USDA and the Iowa Department of Agriculture and Land Stewardship. Once the depopulation was complete and the premises had been cleaned and disinfected, indemnity of $917,100.00 from the USDA has been or will be paid to the owners as compensation for the 356 captive deer depopulated. The Iowa Department of Agriculture and Land Stewardship operates a voluntary CWD program for farms that sell live animals. Currently 145 Iowa farms participate in the voluntary program. The above-referenced captive deer facility left the voluntary CWD program prior to the discovery of the disease as they had stopped selling live animals. All deer harvested in a hunting preserve must be tested for CWD. Animal and Plant Health Inspection Service (APHIS), Veterinary Services (VS) received a total of $3 million in appropriated funding to support cervid health activities in fiscal year (FY) 2014, and made approximately $1.0 million of this funding available for indemnity of chronic wasting disease (CWD) positive, suspect, and exposed farmed cervids. All of the available FY2014 indemnity funding was used to depopulate three CWD-infected herds. However, several States have asked about the availability of Federal indemnity funds for CWD-exposed animals in the future. VS plans to offer Federal indemnity for CWD-exposed cervids beginning in FY2015. Briefly, we will prioritize the highest risk CWD-exposed animals for indemnity based on the availability of funding. Any newly reported CWD-positive herds will be considered for indemnity as they are identified, based first on funding availability and secondly on the risk presented by the herd. We will reassess our fiscal year funding on a quarterly basis so that providing indemnity for exposed animals does not exhaust available funding early in the fiscal year. By taking this fiscally cautious approach, we hope to provide indemnity for positive herds identified later in the fiscal year while removing high-risk animals from the landscape as soon as possible to minimize the risk for disease spread. Further, removal and testing of these exposed animals will provide a better understanding of the disease risk presented by these animals/herds. VS plans to work with our State and industry stakeholders on the criteria to assess the risk and on the process through which States can request this indemnity. These will be finalized in a VS Guidance Document in the near future. We look forward to working with you to implement this process in the coming year. *** Decontaminating Equipment Personal protective equipment (PPE), such as boots, gloves, clothing, etc., supplies, facilities, and vehicles exposed to potentially CWD infected tissues and environments should be properly cleaned and disinfected after each use. As of January 2018, CWD in free-ranging deer, elk and/or moose has been reported in at least 22 states in the continental United States, as well as two provinces in Canada. In addition, CWD has been reported in reindeer and moose in Norway, and a small number of imported cases have been reported in South Korea. The disease has also been found in farmed deer and elk. CWD was first identified in captive deer in the late 1960s in Colorado and in wild deer in 1981. By the 1990s, it had been reported in surrounding areas in northern Colorado and southern Wyoming. Since 2000, the area known to be affected by CWD in free-ranging animals has increased to at least 22 states, including states in the Midwest, Southwest, and limited areas on the East Coast. It is possible that CWD may also occur in other states without strong animal surveillance systems, but that cases haven’t been detected yet. Once CWD is established in an area, the risk can remain for a long time in the environment. The affected areas are likely to continue to expand. 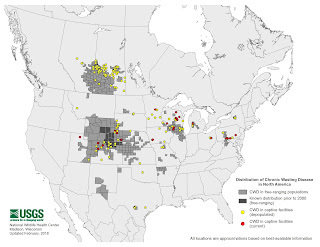 Nationwide, the overall occurrence of CWD in free-ranging deer and elk is relatively low. However, in several locations where the disease is established, infection rates may exceed 10 percent (1 in 10), and localized infection rates of more than 25 percent (1 in 4) have been reported. The infection rates among some captive deer can be much higher, with a rate of 79% (nearly 4 in 5) reported from at least one captive herd. As of January 2018, there were 186 counties in 22 states with reported CWD in free-ranging cervids.